Adding yet more Horrockses to the collection! Many people know that I have a huge obsession with the brand Horrockses and in the past month or so I have added another 5 to the ever expanding collection. I’m getting to the point now that I think I need to get them all together look at the them and work out what I actually have. Unfortunately the collection is spread between 4 different houses (uni house, mums house, dads house and grandparents house) so I’m never quite sure how many I own but I know it is somewhere between 40 and 50! Anyway I’ll give you a little run down of my latest 5. 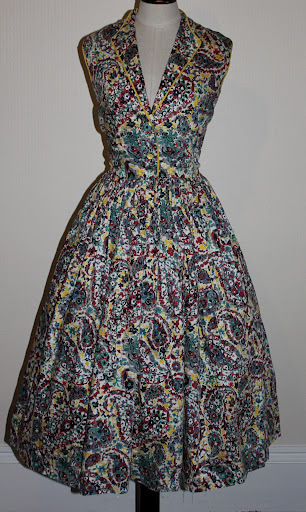 This lovely number has been considerably altered, I’m pretty short and this is far too short for a mid 50s Horrockses, but I find this is quite nice because the alterations mean I can wear it without fear of damage and it is another different print “collected”. It was also the cheapest Horrockses I’ve ever bought- £12 including postage! The next one shows the benefits of understanding your labels. 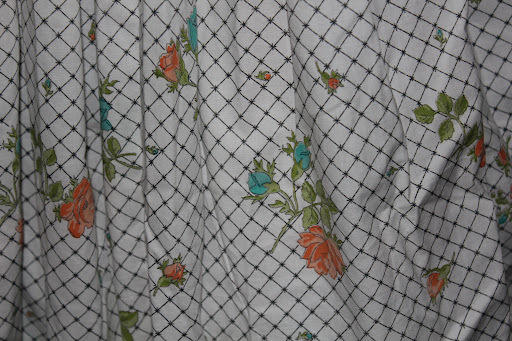 This is so very typical of the style Horrockses was famed for and whilst it actually doesn’t contain a Horrockses label it has its original made in England label, a defining factor in working out wether a possible Horrockses is one or not. The label for this would have almost certainly been in a matching bolero. This one is a bit different as It is actually a Horrockses childrens dress (one of three I own) but being petite it does actually fit me! 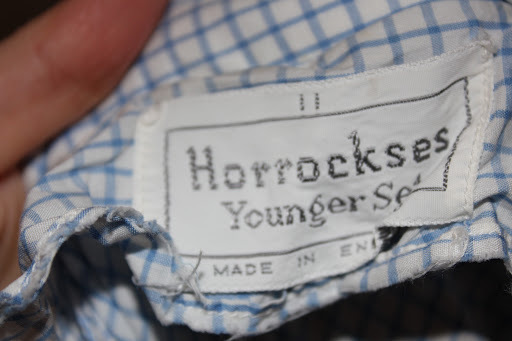 Horrockses in their existence produced two childrens/ younger ranges. Horrockses pirouette and Horrockses younger yet. This is a younger set example and I believe this is quite late on in Horrockses heyday dating between 1958-1964. 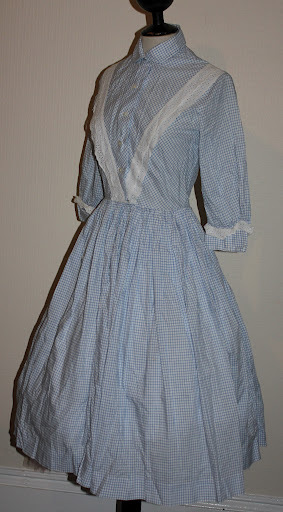 I’ve found price wise that the Horrockses label (white box black writing) that is in this is often dismissed, but I still feel that these dresses are highly collectible and it is only when you get to the labels which have the royal warrant that the dresses really start to loose their appeal. 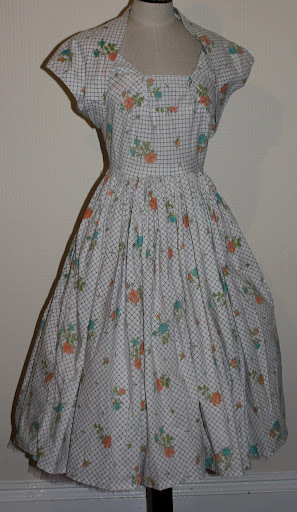 Next off this stunning dress which really is the definition of Horrockses quality. This is made from the real sumptuous cotton you can expect from Horrockses and has a heavy handle and almost satiny finish. 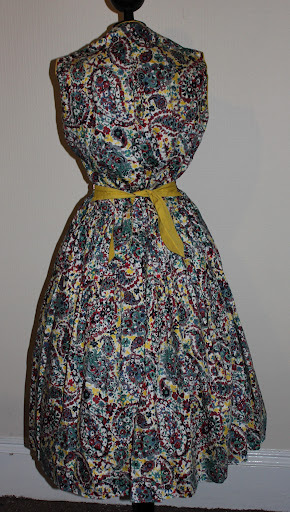 I love the contrast belt feature on this dress, I have another similar one that I blogged about here. This dress has an interesting back vent. It would actually accommodate a rather large bust but being small I think I will be wearing it open instead. 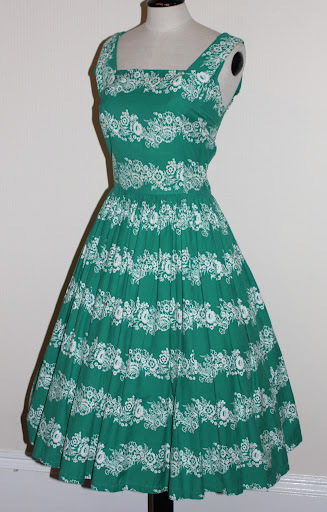 And finally this little number, which I absolutely adore. Again this dress does have heavy alterations (meaning I’m not so worried about altering it further) which decreases its value, but it is still a beauty to look at! What I will say about this dress is the measurements of this. Anyone who follows me on twitter might have seen my anger at a dress that was 4in out with its waist measurement…this is it! Supposedly it has a 24in waist. It is in fact almost 28in. Grrrr alterations here i come! Hope you enjoyed seeing my latest additions to the collection! « See me in vintage ballgowns in this months Homes and Antiques magazine! Wow, I love the green one. It's really cool that you have picked a label and stick to collecting it like this. Thanks for sharing. 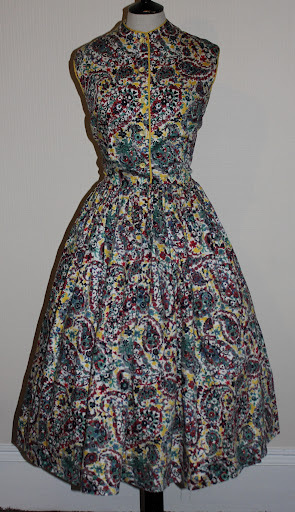 Gorgeous, especially the paisley dress. I replied to your comment on the old blog. All gorgeous, love the green and white very Horrockses. As annoying as being misinformed is it probably worked to your advantage as if it was listed with the 28 inch waist you probably would have had more competition for it.If you don't want to get it altered I could always take it off your hands ;-.Eve xp.s would love to see pictures of the whole collection although would probably sent me over the edge in a fit of jealousy. You have such a lovely collection! I especially like the second from last one.